Grand 1906 Craftsman, just a 20 minute walk from downtown Seattle and vibrant Pioneer Square, home to a variety of galleries, antique shops, cafes, and nightclubs. Eight rooms offer queen beds with down comforters and hand pressed cotton sheets, most with private bath. All but one room feature a gas fireplace and all offer cable TV, phone, and data port. Several rooms with jetted tubs are available. Lovely restored interior with high ceilings, crown moldings, and beautiful hardwood floors with oriental carpets. Spacious guestrooms are furnished with chosen antiques and original northwest art. Quiet, peaceful setting belies the close proximity to downtown. An excellent 2-course gourmet breakfast is prepared to order and served on china and crystal in the formal dining room. The Amaranth Inn Bed and Breakfast is just 3/4 mile from downtown and is one block from a major bus line with parking available. AAA 3-diamond. 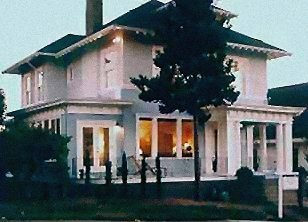 This and other Seattle Bed and Breakfast Inns can be found here in The Register.